Range use is for club members only. No guests allowed on ranges. Children under 18 years old must be accompanied by an adult member, no unsupervised children allowed on the ranges. Allow waiting members use of the range: limit your shooting to 1/2 hour. Shoot at anything but paper targets fastened to the backstops. Drive vehicles of any kind on the ranges. The ranges will be patrolled by the Fish & Game committee members. Your membership card must be presented upon request. 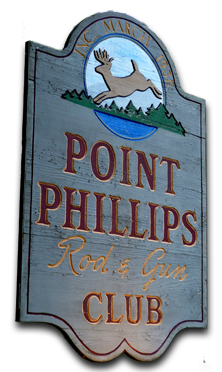 The Point Phillips Rod & Gun Club assumes NO RESPONSIBILITY for any injuries received on the ranges. Consumption of alcohol is permitted in the PPRGC Clubhouse and Pavilion area ONLY; no alcoholic beverages are permitted on or near any range firing area. Alcohol may be consumed only after shooting is completed and firearms have been secured. Anyone who appears to be intoxicated, impaired or under the influence of drugs or alcohol is not permitted on PPRGC property. These ranges have been installed for the benefit of the club members.All members are requested to obey these rules.